When it's so cold out that eggs freeze in weird shapes, the only obvious solution is to cradle a warm coffee in your hands every time you step outside. The new Starbucks "Happy Hour" promotion will make it a little cheaper to put that plan into action. On Thursday, February 7, Starbucks will bring back its almost-weekly "Happy Hour" with an offer for 50% off espresso drinks size grande or larger. That means any hand-crafted espresso drink, including the brand new cherry-flavored mocha. The deal is good from 3pm to close at participating locations all across the country. That excludes hot and cold brewed coffee, Frappuccinos, and any ready-to-drink beverages. If you're looking to turn drinks into hand warmers, it's nice to get a discount on your second or third hand-warmer of the day. Especially if you need a little pick-me-up because you made it all the way through the State of the Union on Tuesday, and it added 45 days to your week. 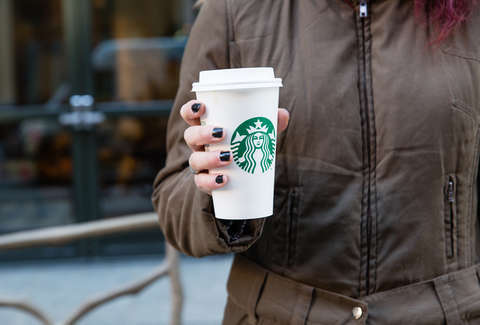 If you're looking for a cheap latte on Thursday, here's how you make it happen: Download the Starbucks mobile app. You used to be able to sign up for an email to get the discount, but per an email sent by Starbucks on Wednesday night, the way you get the happy hour discount has changed. Future offers will only be sent to the app and will not be redeemable through email or if you're not a Starbucks Rewards member. (It's free to sign up for the rewards program.) Once you have the app downloaded, look in your app's inbox, and you'll find an offer you can flash to the cashier. It's worth calling ahead if you're looking to get that bonus coffee Thursday afternoon. As mentioned above, the happy hour is only available at participating locations. Getting that Thursday afternoon coffee is just like asking for a push out of the snowbank you just drove into. You just need a little push to help you get to your destination. A previous version of this story incorrectly noted that Frappuccinos were a part of the nationwide offer. Only espresso drinks are part of the deal for February 7.